Good afternoon lovelies! I hope you have all had fantabulous weekends and are enjoying the rare bit of sun we seem to be experiencing today? We are fast becoming huge fans of Tub of Jelly Photography. Elizabeths work is so modern and quirky it’s hard not to fall in love with it. I am also a secret fan of her blog, not just because of all the amazing photography she features over there but she also has a cat gif which pads away looking super content as the images load. As she says “it is the gif. that just keeps on giving”. True that! Anyways enough of cat gifs lets move on to todays gorgeous Vintage 50’s style wedding. I must say I am loving the florals here, the brides bouquet is just beautiful and the added touch of freshly cut flowers in her hair is just adorable. I also really admire Dawn and Allan and their generosity, it’s not often that you come across a couple that use their wedding day to raise money for a charitable cause, yet that is exactly what they did. Huge round of applause for these two! Dawn: We were keen for our wedding to be quite informal and relaxed so we held our wedding at the West Brewery in Glasgow. To help us and our guests feel at ease on the day we decided to made a list of all the things we hadn’t enjoyed at weddings in the past and the we tried to find ways to do those things differently or not at all. After creating our list there were a number of traditions I still wanted to keep such as having a wedding cake, first dance etc which I am now so happy about as they really did make for some special moments on our wedding day. My Dress was a Stephanie Allin. As we getting married in the middle of winter I wanted it to be practical so I had it altered to be ballerina length. This was great for keeping the dress off the cold winter ground otherwise I think it would have been wrecked by the end of the day. 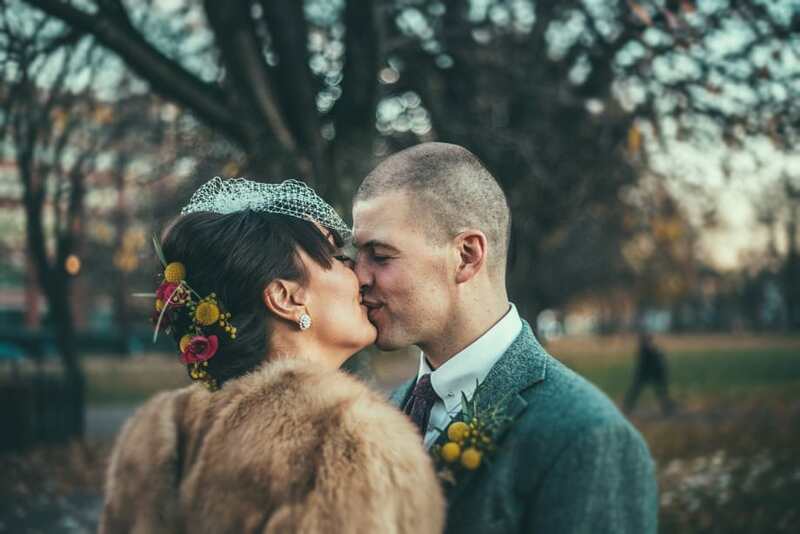 We wanted to make the most of our November wedding with some fundraising for Movember. So Allan grew out his moustache until the eve of the wedding, I think we raised around £700 in total. Our meal was fantastic and went down well with our guests. Big dishes of food were placed on each table for guests to help themselves, so it had a really “family dinner” feel. It got strangers talking, as they had to ask others to pass the spoon etc! We had wedding cake for pudding which tasted delicious and was the perfect way to end the meal. We truly loved our day and wouldn’t have changed a single thing! That wedding cake looks almost too good to eat and doesn’t the West Brewery look like a cool place to hold a wedding! Adore the brides Stephanie Allin gown, beautiful wedding too, great little personal touches !